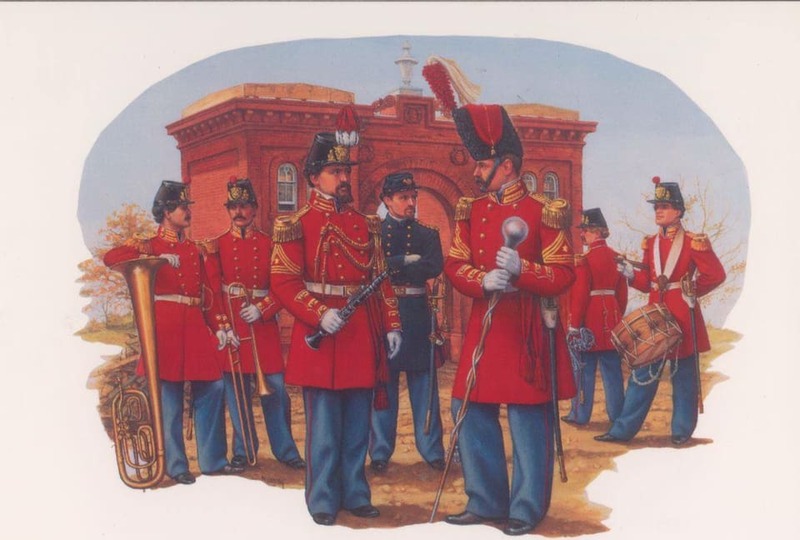 In anticipation of the dedication of the new cemetery in Gettysburg to be held in November 1863, Secretary of the Navy Gideon Welles approved a request by an “agent of the grounds” to have The United States Marine Band present at the ceremony. “The [Navy] Department has no objection to the Band being sent to Gettysburg, Pa., to take part in the ceremonies to this sacred purpose,” Secretary Welles wrote in a letter to the officers of the Marine Corps dated Nov. 3, 1863. The band proceeded with President Lincoln by train to Gettysburg, via Baltimore and Hanover Junction, on Nov. 18. Overseen by Leader Francis M. Scala, the 27 members of the band, including John Philip Sousa’s father, trombonist Antonio Sousa, serenaded the president and guests with a lunchtime concert on the train. There was a Marine Officer also assigned to this mission. Aboard the train that carried Lincoln was another band also, the 2nd US Artillery Band who boarded in Baltimore. The two bands played on the trip, the Marine Band even leaving the train to play in Baltimore while the train while being uncoupled and moved one by one to the Northern Central Station. The Birgfeld Band from Philadelphia would arrive later with the governor of Pennsylvania. Lincoln had important business to tend to for the next day….. This entry was posted on Sunday, November 18th, 2018 at 6:03 am	and is filed under Bugle Stories, General Interest, Getting Started on the Bugle, History of Taps, History of the Bugle. You can follow any responses to this entry through the RSS 2.0 feed. You can leave a response, or trackback from your own site.